Four months after the console version, you can now delve deeper into the secret society of assassins with the sequel to the blockbuster action-adventure game. 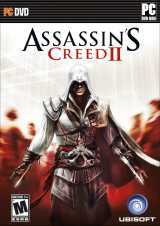 Assassin's Creed 2 is an epic story of family, vengeance and conspiracy. The game is set in 2012, with player-controlled protagonist Desmond Miles escaping from Abstergo Industries with an employee, Lucy Stillman, after being forced to relive the genetic memories of ancestoral assassin Altaïr ibn La-Ahad through a machine known as the "Animus". After escaping from Abstergo, Desmond enters a device identical to the Animus and relives the genetic memories of ancestoral nobleman Ezio Auditore da Firenze, who lived during the Renaissance period of the late 15th and early 16th centuries in Italy. Ezio befriends Leonardo da Vinci, takes on Florence's most powerful families and ventures throughout the canals of Venice where he learns to become a master assassin. This game retains the core gameplay experience that made the first opus a resounding success and features new experiences that will surprise and challenge players. There's stronger emphasis on open-world exploration and interaction, non-linear gameplay and greater mission variety compared to the first Assassin's Creed. The game also has improved non-player character AI and combat mechanics, and a new economic system. The first two DLCs (Battle of Forli and Bonfire of the Vanities) for the Playstation 3 and Xbox 360 that were released in January and February 2010 are directly included in the PC version. Also, Ubisoft tried a new anti-piracy protection on this game that forces the players to be connected to the internet while playing.